Aaahhh, the peace and tranquility that comes from drinking Japanese matcha powder. The earthy and creamy goodness is surpassed only by the copious benefits to our health. Matcha is matcha, right? So not true! Knowing where your matcha came from is one of the single most important aspects of matcha drinking. The market is full of imitations and knock-offs and matcha is not immune to that practice by any means. Without question, the world’s best matcha comes from Japan, plain and simple. While matcha originally came from China, Japan has perfected matcha growing and harvesting methods meticulously for over 800 years and now represents the gold standard of matcha. Because matcha is ground from the entire leaf, it is most critical your matcha is authentic, pure and organic. Anything less, and you risk exposing yourself to potentially harmful substances and you won’t be reaping the impressive nutritional content of pure organic Japanese matcha powder. The market is flooded with cheap matcha that is very far removed from legitimate matcha, most of it coming from China. Why is Chinese matcha so cheap and can that low brow price come with any potential hazards? Yes indeed it can so read on if you’ve got Chinese matcha in your cupboard. As Japan started exporting Japanese matcha powder, China started to produce ‘matcha green tea powder’ that is produced under ‘simulated’ Japanese matcha farming techniques. This simulated version of matcha possesses much different qualities, some quite obvious and some undetectable differences. The latter is what is most concerning. The most obvious difference is color. 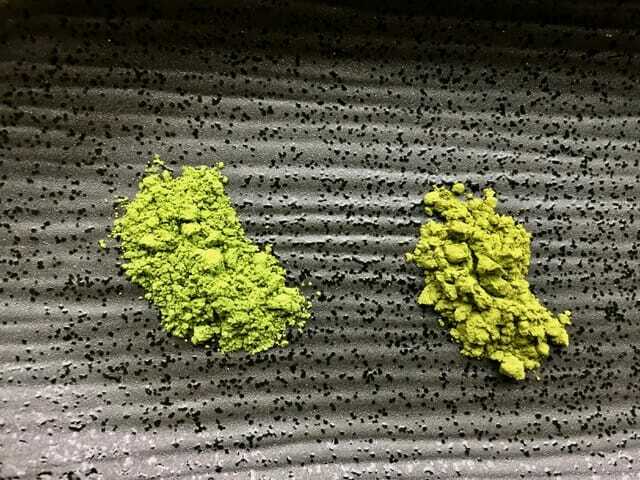 Comparing Chinese and Japanese matcha powder is night and day. Chinese matcha powder is generally a dull green with brown or gold overtones whereas Japanese matcha powder is a bright and vibrant emerald green. The color difference comes about for a few reasons – firstly Japanese matcha is shaded during the last 3-4 weeks of growing to encourage more chlorophyll production whereas most Chinese matcha is not shaded. Secondly, Chinese matcha powder can consist of stems, branches and veins ground together with the leaf itself whereas pure organic Japanese matcha powder generally consists of only the de-veined leaf. Chinese matcha powder production most often includes a ‘pan-frying’ step supposedly to stop oxidation, but one can only imagine what that step does to the nutritional value! Japanese matcha powder is cautiously steamed and air-dried preserving every last gram of goodness. The last culprit of color is the soil in which it was grown and pesticides used which brings to light a whole host of other concerns. A Greenpeace study in 2013 of 18 random Chinese teas found toxic pesticides in 12 of the studied samples that are banned by the Stockholm Convention, an international environmental treaty. Additionally, Chinese green tea samples have been found to exceed the acceptable limit of radiation levels. In contrast, Japan who drew the world’s attention after the 2011 earthquake that damaged the Fukushima nuclear plant has tested out with no significant radiation levels post-2011 in the tea growing areas of the country. What’s most notable here is that Japan has one of the most strict maximum radiation levels in the world – 100 Becquerels per kilo as compared to the USA limits which are 1200 Becquerels per kilo! The stringent standards set forth by Japan during matcha growth and production results in pure unadulterated matcha that offers the maximum nutritional benefit. Buy organic matcha and that benefit is enhanced with absolute assurance of safety in your cup each and every time. It is important to note, that many other types of Chinese green tea certainly hold validity for a variety of health benefits and have been revered in the Chinese culture of centuries but matcha imitations need to be viewed cautiously however. Really understanding the difference between Japanese and Chinese matcha is crucial not only for your health and safety, but also for the Zen-producing experience and taste. 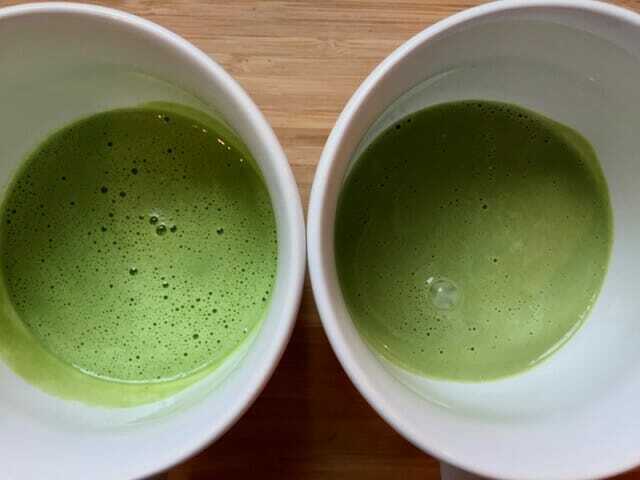 A cheap imitator matcha will not only have a brownish hue in your cup, it will taste sandy and be difficult to froth. Pure organic matcha will be brilliantly green and have a frothy and creamy texture. I’ve done a side-by-side comparison of pure organic Japanese matcha and Chinese organic matcha using exactly the same preparation and coconut milk. The difference in texture and color is obvious and let me assure you taste was the most notable difference. The Chinese matcha was so harsh and bitter it was completely undrinkable and the gritty residue in the bottom of the cup was quite significant. Acquiring pure organic Japanese matcha couldn’t be easier right here.